﻿ New dinosaur site discovered along Yukon River - Zigong Dinosaurs World Science & Technology Co.,Ltd. (SitNews) - University of Alaska Museum of the North researchers have found a major new site for dinosaur fossils in Alaska along the Yukon River. Hind foot print of an herbivorous dinosaur. In July 2013, researchers set off in boats for a 500-mile journey down the Tanana and Yukon rivers. Co-discoverer Kevin May, operations manager at the UA Museum of the North, says the goal was to explore as many beaches as possible for evidence of dinosaurs. “Based on what we know about the geology along the Yukon River, the rocks exposed downriver from Ruby suggested they might be a good place to find dinosaurs”. They found much more than they expected: dinosaur footprints big and small, from both meat- and plant-eaters. Paul McCarthy, Druckenmiller’s colleague from the Department of Geology and Geophysics at the University of Alaska Fairbanks, says the trip was amazing. 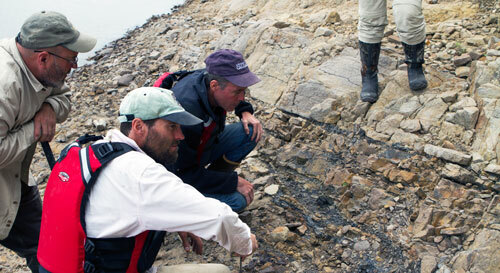 Kevin May, Pat Druckenmiller and Paul McCarthy (left to right) inspecting an outcrop of Cretaceous rock along the Yukon River. Druckenmiller says that one of the reasons the Yukon River dinosaur tracks may have gone undiscovered for so long is their method of preservation. 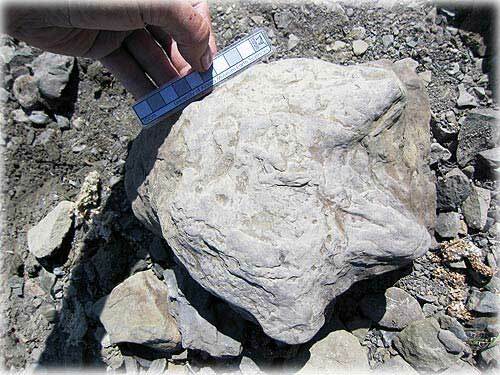 They are “natural casts” formed when sand filled in the actual footprint after the dinosaur stepped in mud. The discovery is significant in that the Yukon River fossils are geologically older than other major sites in the state and that they preserve a record of dinosaurs previously unknown in the state. The museum is working with villages and Native corporations along the Yukon River to share information about the discovery with local communities and to coordinate future exploration. The research team also included Jørn Hurum, from the University of Oslo Natural History Museum, UAMN earth sciences collection manager Julie Rousseau, and several UAF students. Roger Topp, head of production at the museum, filmed the expedition for an exhibit the museum is planning for the summer of 2015.